We install new sewer lines and replace sections of old, broken or corroded sewer lines. This includes replacing or repairing main sewer lines, kitchen, laundry, tub and shower lines. Many times, tree roots are responsible for broken sewer lines. We also install cleanouts in order to make drain cleaning easier and more efficient. Pipe bursting is a technique of replacing existing sewer pipes. The existing pipe, once burst, becomes the guide path for the new pipe being installed. This technique bursts the old pipe and in doing so, displaces the fragmented old pipe into the surrounding soil. This creates a hole of roughly the same dimension as the original. Pipe bursting has been very popular in the last few years. Since this is done below ground, it saves your yard and driveway which causes less disruption to your property. This process also saves you time and money. We can rehabilitate existing sewer lines from 4" to 6" in less than a day, in most cases in a few hours. The lining system is the only system approved by the City of LA. The lining materials meet their strict non-stretch liner requirements. 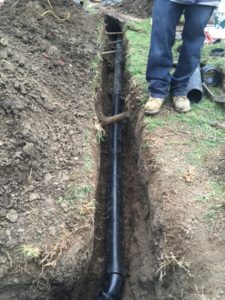 The liner allows the installer to insert the liner through the existing sewer line to the city main sewer connection without stretching into the city sewer main. We repair sewer laterals that connect a home or business to the city wastewater’s main pipe line. We are approved by the City of Los Angeles as a bonded sewer contractor.